The Grado Prestige Series SR60e are among the company’s lower priced options, so do they hold up to the company name? If you’re looking to get into the world of open-back headphones without spending a ton of cash, these are a fantastic option. Grado Labs is a well-loved brand among many audiophiles, and with good reason. Since their start in 1953, Grado has continuously offered solidly built products that are crafted with a level of care and detail rarely seen. Though this reputation has served them well, it has also created the impression that everything the company makes is expensive, and while you can indeed spend upwards of $1,500 on a pair of Grado headphones, you can also pick up a few for less than $100. In this review we’re focusing on one of these lower-priced options, the Grado Prestige Series SR60e. Part of Grado’s newly launched e series, this pair of headphones is the successor to the well-regarded SR60i. Do these headphones hold up to the high standards placed by their predecessors? Read on for our impressions. In keeping the price of the SR60e headphones as low as it is, Grado had to skimp somewhere, and it’s clear the packaging is one of those areas, which we have absolutely no problem with. The box that holds the SR60e headphones is fairly thin cardboard, though the headphones are secured in form-fitting foam to keep them bouncing around inside the box. The headphones, complete with the already-attached 1/4″ adapter are all that you’ll find inside the box. There isn’t even a separate manual — the inside of the box itself serves as the manual, which is a neat touch. The Grado Prestige Series SR60e headphones have a unique, old-school look to them that could prove to be divisive: I personally love the look, but if you’re more used to the sleek, modern look sported by many current headphones, you may find these to be strange looking. This is due in part to the open-back design: instead of being completely covered, the back of each earcup is partly open, covered with a grille that allows you to see the components inside. In general, these look like that would be at home in a 1970s recording studio which, again, is a plus to me, but your mileage may vary. Looking on the inside of the box as I opened it for the first time, I noticed a warning that some people might find these headphones to be too tight. Grado says that if these do feel tight, you can pull on either side slightly to allow for a looser fit, but they warn against overdoing it, as you can make the headphones too loose. I didn’t have a problem; these seemed to fit me just fine right out of the box. This, combined with the high level of adjustability, led to a fairly comfortable fit. Though these don’t boast the kevlar and carbon fiber, military-grade build that we’ve seen other headphones sporting, they still feel fairly tough. That said, these are meant more for serious listening than to be taken everywhere, so you might want to be a little careful if you’re just throwing them into a backpack. You won’t find any fancy built-in remotes, or even a removable cable here. Again, with the quality of the components used, Grado had to make some sacrifices to be able to see the SR60e headphones for this price. What you will find is a fairly long cable that is very thick. Ostensibly, these thicker cables are better for sound quality, but it also means that you’re less likely to wear the cable down through everyday use. In testing, I very briefly tested the Grado Prestige Series SR60e with mobile devices to make sure that they would work well, and they did. That said, as I mentioned above, these are first and foremost built for sound quality, so the majority of my listening was done through a Focusrite Saffire Pro 40 audio interface. I listened to a few podcasts and an audiobook to check performance with the spoken word, but mostly I listened to music from different genres and eras. As Grado puts it on the website for the SR60e: “Everyone loves a thumping bass and kick-drum, but not at the expense of everything else.” You’ll certainly hear the bass, but it’s not overemphasized as it is in many headphones. This could come as a shock if you’re only used to bass-heavy headphones, but the aim here is balance, and the SR60e deliver. Grado also speaks of their headphones’ world-renowned midrange and they are not wrong. Even in these entry-level headphones, the midrange is very clear and open sounding. This combined with the soundstage that open-back headphones are known for lends an extra level of realism to reverb and room sound. The highs are crisp and clear with excellent detail, lending a shimmer and sheen to cymbals and high string instruments without ever wandering into the realm of harshness. As I mentioned before, the soundstage in these headphones is excellent. 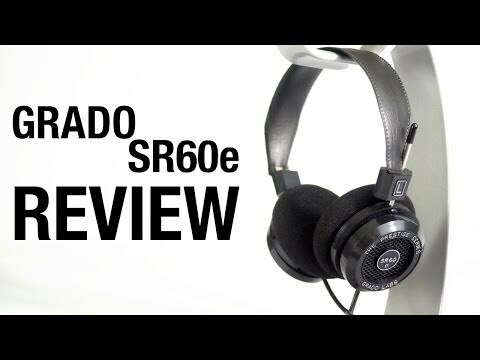 This is somewhat expected in open-back headphones but I was surprised at just how good the entry-level SR60e headphones sounded. Overall, these headphones are great for both critical listening and just enjoying your music. If you’re looking for the best audio performance to price ratio, the Grado SR60e are an absolutely amazing deal. You might be able to get a pair of open-back pair of headphones for less, but I would be surprised if they came anywhere near sounding as good. Sure, these can’t really be compared to Grado’s higher-end offerings, and they’re not ideal for every situation, but for pure music enjoyment, these headphones are a great buy.